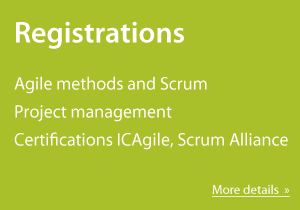 The next two Scrum certification trainings in Prague will be in December 2018. The CSM – Certified ScrumMaster will take place on December 3-4, 2018 and the CSPO - Certified Scrum Product Owner will take place on December 6-7, 2018. Both trainings are planned in Czech and they are the last ones for the year 2018. Register here for the course or send me an email if you have any questions. Feel free to ask if you need training in English we run classes around Europe as well. We also organize private company CSPO/CSM trainings for larger groups (Czech/English).